George Tinckler Case was a performer and also had his own company producing English Concertinas in the early 1850s. He originally worked for Wheatstone, but founded his own company in March 1849, buying a going concern from Joseph Scates. He continued in business until December 1854 after which time he began the process of transferring everything to Boosey. 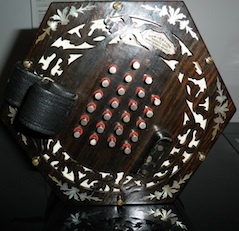 Most of the instruments are labelled as "Patent Concertina by George Case" with an address of Boosey in one of its forms. Case finally sold his business to Boosey in 1856 so very few were sold purely as Case Concertinas. A characteristic of Case's English Concertinas is having double reed pans which were an attempt to solve the perceived difference in tone between the press and draw notes on an English Concertina (which are the same). They consist of a reed pan with partitions on both sides, to try to equalise the sound. Thus, a different reed, identically tuned, provides the press and draw notes. Joseph Scates seems to have been the first maker to use them, followed by George Case. George was a virtuoso of the violin, piano and concertina and toured extensively with his wife.